CASA collaborates with Understory to validate hail and wind sensor measurements. UMass produces short video describing CASA's counter drone research. Groundbreaking radar network in Dallas has local ties. CASA researchers are leading the development of new apps and tools. New system enables improved weather predictions in the region. Zink’s CAREER Research Will Make More Economical Sensor Networks for Border Security, Weather Forecasting, and Other Uses. The tornado East Texas never saw coming - and why they may not see the next one. City of Addison receives new weather radar technology. A fourth component of the new radar system was installed Tuesday atop a municipal building in Addison. The city of Midlothian received its newest addition when crews installed a CASA radar at the Midlothian Police Department Justice Center. New radar could save lives when spring storms hit DFW. What will it take to make tornado prediction better? CASA Director David McLaughlin presents Distinguished Faculty Lecture and receives Chancellor's Medal. The CASA radar system will be tested in the Dallas - Fort Worth area in spring 2012. New low-power radars will provide better storm coverage. Colorado State University honors Professor Chandrasekar with award for innovative excellence. CASA Researcher Joe Trainor (UDel) gave the keynote talk for the Integrated Warning Team meeting organized by the National Weather Service Fort Worth Forecast Office. Brenda Philips discusses latest research. CASA researchers try to improve warning systems in the hopes of saving more lives. David McLaughlin, Kevin Kloesel, Paul Smith, and John Armstrong have been named to newest National Academy Panel study on Weather Service modernization. In the recently published report, “Observing Weather and Climate from the Ground Up: A Nationwide Network of Networks,” the National Academy Press notes CASA’s significant contribution to the future development of weather observation and prediction. In July 2010, the Central American and Caribbean Games at Mayaguez provided a real-world test that revealed the power of the CASA Student test bed. IEEE International Conference on Systems, Man, and Cybernetics Best Student Paper Award awarded to Don J. Rude, Ellen J. Bass and Brenda Philips. Chris Meyers of UVA (advisor Roman Krzysztofowicz) is a finalist in the UVA Undergraduate Research and Design Symposium 2010. A UMass-Amherst team is incorporating their Virtual Sensing Environment (ViSE) into Global Environment for Network Innovations (GENI) prototyping. CASA Associate Director Ming Xue,and meteorology graduate research assistant, Nathan Snook, were featured in ScienceNow. CASA submitted a congressionally funded report on the feasibility of new technologies to fill coverage gaps in today’s national weather radar network. 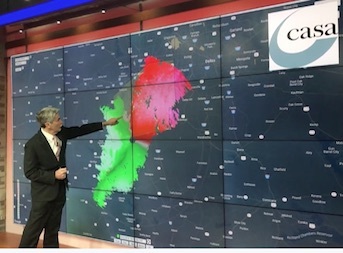 Data from the CASA radar network is now LIVE on NBC 5 TV station in Dallas Fort Worth, bringing high resolution radar imagery to millions in North Central Texas.